Kylie Jenner Officially Lands The Title Of Youngest Self-Made Billionaire! Home › Business Blitz › Kylie Jenner Officially Lands The Title Of Youngest Self-Made Billionaire! Kylie Jenner has finally hit billionaire status at the age of 21, making her the youngest “self-made” one to do so… at least according to Forbes! The glossy tapped into the KUWTK starlet’s brain to recognize her milestone achievement for an article published Tuesday, and Kris Jenner‘s daughter is feeling good about her new title. A pat on the back we’re sure other entrepreneurs would do anything for! And it’s worth noting, her big sis Kim Kardashian West‘s net worth only comes in at $350 million. Those are still some big numbers, but it hasn’t landed the momma of three on the same list, that’s for sure! You may remember, the 38-year-old business mogul actually defended her sibling’s “self-made” title after Forbes announced in this past August’s issue that Kylie was set to become the youngest ever. 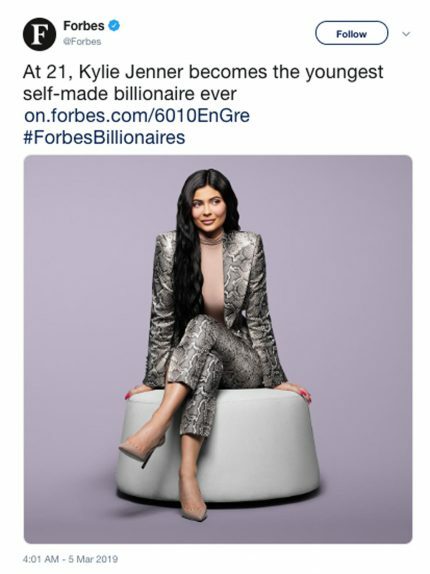 The lack of recognizing their privilege sparked backlash back then, so we can only imagine how people will feel now that the young makeup mogul can add “youngest-ever self-made billionaire” to her resume. While neither star has directly addressed the rumors, it’s still comes as a shocker since Khloe Kardashian faced her own drama surrounding Tristan Thompson and Jordyn Woods last month! Although, we doubt King Kylie will be losing any sleep over the controversy tonight with the release of this article.